The International Diabetes Federation predicts that one in 10 adults could have diabetes by 2030, according to their latest statistics. 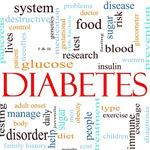 In a report issued on Monday, the advocacy group estimated that 522 million people would have diabetes in the next two decades, based on things like aging and demographic changes. The figure includes both types of diabetes. The group expects the number of cases to jump by 90 percent even in Africa, where infectious diseases have previously been the top killer. Without including the impact of increasing obesity, the International Diabetes Federation said its figures were conservative.